You are never to old to obtain a positive result through exercise. THE TIME IS NOW. While it is true that we cannot stop the calendar from moving, exercise can do something to slow the aging process and even improve our health. Studies have shown that exercise can benefit our heart and respiratory function, lower blood pressure, increase strength, improve bone density, improve flexibility, quicken reaction times, reduce body fat, improve balance, and reduce susceptibility to depression, disease and injuries. It also gives people more energy to do other things that they enjoy. You are never to old to obtain a positive result through exercise. Tests have shown that no matter when a person starts to exercise, significant improvement can be achieved, and fairly quickly. Exercise also increases oxygen and blood flow to the brain which helps us to maintain good mental health. There’s no avoiding it — exercise benefits every muscle in the body, including the one between our ears. This program has been developed through the Victoria Order of Nurses (the V.O.N.) especially to help older adults become more fit and, consequently, less likely to be affected by disease or injury. People will be led to take part at their own pace and level of comfort as they increase their stamina, strength and flexibility. It is a fun and gentle exercise program led by certified instructors who have been trained by the V.O.N., including Peter and Geri Spencer from St. John’s. 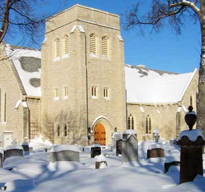 The program is offered at various locations throughout Winnipeg, including at St. John’s Anglican Cathedral. These exercises have been running since the Autumn of 2005 and we will be re-starting the groups at St. John’s Cathedral after the Christmas break. This program will again be held in the hall in the basement of the church on Tuesday and Friday mornings from 10:00 to 11:00 a.m., beginning January 11th & 14th. can bring with you or purchase from us. Everyone is welcome. Please join us to improve your fitness in a friendly and fun atmosphere.